¡Sher E Punjab entrega en tu dirección! Sher E Punjab está cerrado momentáneamente en Domicilios.com. The Ginger, Garlic, Celery, Spring Onion Whites, Green Chillie, Fried Cheese. Calentar el Aceite y Agregar el Jengibre, el Ajo, el Apio, Cebolla de Primavera Blanca, el Queso Frito y Chiles Verdes. Pieces of Fish Coated in a Tradicional Better and Cooked. Served with the Chutney. Trozos de Pescado Cocinado en Harina de Garbanzo y Especias Hindúes. Fritas a Perfección. Lettuce and Fresh Vegetables Topped with our House Dressing. Lechuga y verduras Frescas Cubiertas con Nuestra Salsa de la Casa. Finely Grated Cucuber, Onion, Tomato and Mild Spices in Natural Yogurt. Ensalada de Pepinos, Cebollas, Tomate, Piña y Especias en una Mezcla de Yogurt. Prawns Cooed in a Aromatic Sauce with Ground Cashew Nuts, Cream and Mild Spices. Langostinos Cocinados en Aromática Salsa con Nueces y Especias. Prawns Cooked in a Tradicional Curry, Flavored With Sautéed Onions and Tomatoes. Langostinos Cocinados en Curry, Tomates, Cebollas y Especias. Pieces of Fish Cooked in Delicious Goan Style Sauce with Coriander Arvej and Dried Cocunut. Trozos de Pescado Cocinados en Deliciosa Salsa Estilo Goa con Semillas de Culantro y Coco Seco. Pieces of Fish Cooked in a Traditional Curry and Flavored with Sauted Onions and Tomatoes. Delicioso Trozos de Pescado Cocinados en Curry, Tomates y Cebollas. Lentejas sazonadas en mantequilla, cebollas, tomates, especias y hierbas. Lentils seasoned in butter, onions, tomatoes, aromatic spices and herbs. Trozos de queso y espinaca cocinados en aromáticas especias y hierbas. Spinach and a delicate Indian cheese is cooked incooked in aromatic spices and herbs. Papas y arvejas cocinadas en delicioso curry y queso fresco. Potatoes and green peas cooked in delicious curry sauce & cottage cheese. Garbanzos cocinados con tomates, cebollas, kion, ajos, especias y hierbas. Chick peas steame with tomatoes, onions, ginger, garlic and other herbs. La coliflor cortada en ramilletes, guisantes, judias verdes, zanahorias shelled. French, picado. Cauliflower cut into florets, green peas, shelled. French beans, carrots chopped. Guisantes, zanahorias, frijoles, pimiento, cebolla, tomate y puré de jengibre, pasta de ajo. Peas, carrots, beans, capsicum, onion, tomato puree, ginger and garlic paste. Corte el queso en piezas largas, Hacer un batido de besan, sal, jengibre, y ajo, pasta, semillas ajwain. Cut cheese into long pieces, Make a thin batter of besar, salt, ginger, garlic, paste, ajwain. verduras cocinadas en aromáticas, curry de Kaju, yogurt y especies. Fresh vegetables cookes in aromatic curry with yogurt, cashews, coconut and Indian spices. Bolitas de verduras rellenas, cocinadas en curry ligeramente picantes. Stuffed vegetables rolls, cooked in mildly spiced creamy curry. Mixtura de verduras cocinadas en aromáticas especias arvejas. Fresh vegetables ccoked in Indias spices. Queso fresco con arvejas cocinadas en sabroso curry, ligeramente picante. Green peas with homemade Indian cheese cooked in mildly spiced curry. Berenjena rostizada y cocinada con cebollas y tomates en delicioso curry. Mesquite smoked eggplant cooked with onions, tomatoes & spices. Papas con coliflor cocinadas en aromáticas especias. Cauliflower and potato cooked with a blend of spices. Chicken Curry Cooked with Fresh Mushrooms and Spices. Curry de Pollo Cocinado con Setas Frescas y Especias. Tender Chunks of Boneless Chicken Cooked in Tandoor and Prepared with Tomato, Curry, Spices and Butter. Tiernos Trozos de Pollo deshuesado Cocinado en Salsa de Tomate, Mantequilla y Especias. Tender Chicken Pieces Cooked in a Tomato Based Sauce with Spices. Tiernas Piezas de Pollo Cocinados en Salsa de Tomate, Especias y Mantequilla. Stuffed Chicken & Rolled Together and Cooked in Mildly Spiced Creamt Onion Curry. Bolitas Rellenas de pollo, Cocinadas en Curry y Hechos de Cebolla. Hot Chicken Curry Prepared in Tomato Sauce with a Touch of Coconut and Vinegar. a Delicious Goan Favorite. Pollo en Curry Picante al Estilo de Goa, con un Toque de Vinagre y Coco. Succulent Chicken Simmered in a Mildly Spiced Curry Sauce. ExquisitoPollo Macerado Cocinado en Salsa de Tomates, Especial y Mantequilla. Oven Baked Cubed Boneless Chicken Cooked in a Creamy Curry. Trozos de Pollo Deshusado Cocido al Horno en Cremoso Curry y Especias. Chicken Cooked with Fresh Carrots, Potaroes, Pesa, and Other Seasonal Vegetables. Pollo Cocido con Zanahoria, Patatas, Guisantes y tras Verduras de Temporada. Chicken Cooked in Aromatic Curry with Yogurt, Cashews and Indian Spices. Pollo Cocinado en Aromático Curry de Kaju, Yogurt y Aromática Especial de la India. Chicken Cooked in Aromatic Curry Cooked in Madras Style. Pollo Cocinado en Aromático Curry, Sazonado en Semillas de Moztaza y Canela al Estilo de Madras. Ligeramente Picante. Boneless cubes of lamb cooked with mushrooms in chef's special curry sauce with touch of cream. Cubos de cordero deshuesado cocinado con champiñones en chef, salsa de curry con un toque de crema. Cordero cocinado con trozos de cebolla y salsa espesa. Pieces of lamb meat cooked in our homemade curry. Trozos de carne de cordero cocinado en delicioso curry. Lamb cooked in aromatic curry with yogurt, cashews and Indian spices. Trozos de carne de cordero cocinado en delicioso curry, yogurt, nueces y especias de la India. Simple white rice. Arroz blanco simple . Indio-chinese style fried rice prepared in a wok, using soy sauce & your choice of filing. Arroz frito en wok estilo Indio Chino, y el complemento de opción. 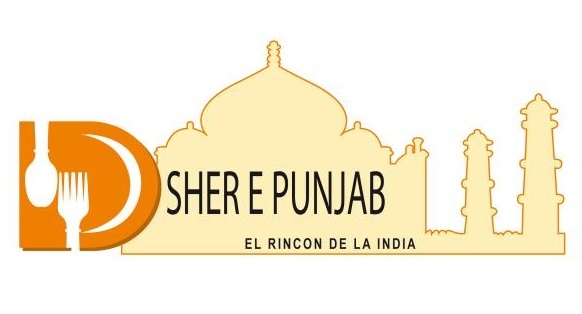 Especialidad del restaurante Sher e Punjab. Rice cooked with vegetables, yogurt, nuts, spices and herbs. Arroz cocinado con verduras, yogurt, nueces, especies y hierbas. Rice cooked with vegetables, yogurt, nuts, spices and herbs. Arroz cocinado con chivo, yogurt, nueces, especies y hierbas. Rice cooked with goar mear or chicken, vegetables, yogurt, nuts, spices and herbs. Arroz cocinado con chivo, yogurt, nueces, especies y hierbas. White rice slightly flavored with cumin seeds. Arroz blanco ligeramente sazonado con semillas de comino. Plain white rice cooked with green peas. Arroz blanco cocinado con alverjas. White rice cooked with vegetables and lightly flavored with spices. Arroz blanco cocinado con verduras y ligeramente sazonado con especies. Soft and Delicious Bread Coated With Butter and Cookes in Tandoor. Suave y Delicioso Pan Cubierto de Mnatequilla y Cocinado en Tandoor. Bread with Chese and Spices Cooked in Tandoor. Delicioso Pan con Queso, Especias y Hierbas Cocinado en Tandoor. Soft and Delicious Bread with Cheese Cooked in Tandoor. Suave y Delicioso Pan con Queso Cocinado en Tandoor. Multilayer bread Stuffed with Potatoes, Made with Butter. Pan de Múltiples Capas Rellenas con Patatas, Hechas con Mantequilla. Fine Flour Bread Baken Topped with Fresj Onion and Cooked in Tandoor. Masa Delgada Cubierta con Cebollas Frescos y Cocinado en Tandoor. Indican Tea "Chai" - Te Hindú "Chai"